BOB ABERNETHY, anchor: Author Anne Lamott may shatter many people’s stereotypes about what a successful spiritual writer is like. She’s a dreadlock-wearing, politically liberal, born-again Christian who uses biting humor — and sometimes foul language — when she describes her deeply held personal faith. Some readers are offended, but her books about her spiritual journey have become national best-sellers. Her newest is called GRACE (EVENTUALLY). It comes out later this month. Kim Lawton visited Lamott in Northern California. 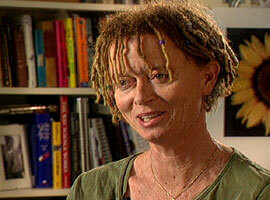 ANNE LAMOTT (Author) (In Washington, DC Speech): And you can tell you’ve created God in your own image when it turns out that God hates all the same people you do. KIM LAWTON: She’s witty, irreverent, and often highly provocative. 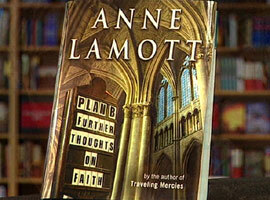 Ms. LAMOTT (In Washington, DC Speech): Faith without works is dead. It’s just not nice to sit around — you can sit around in your prayer breakfast with all this faithy-faith and all this talking and thinking and “hallelujahing” and it’s nothing. It’s nothing to God. I mean, I think it pisses God off. LAWTON: Author Anne Lamott is controversial in some circles, but she has landed on the NEW YORK TIMES best-seller list for her candid and, yes, quirky approach to faith and life. Ms. LAMOTT: If Jesus does not have a sense of humor, I am so doomed that none of this matters anyway. LAWTON: Lamott describes herself as a left-wing, born-again Christian with a bad attitude. She’s written several critically acclaimed novels, but in recent years she’s been best known for her books about her personal spiritual journey. Ms. LAMOTT: I don’t find spiritual insight sitting around thinking “thinky” thoughts about what it all means and what — who God is and who shot the Holy Ghost and, you know, I find God in the utter dailyness and mess of it all. LAWTON: Lamott grew up in Northern California with atheist parents. As a young teenager, she started drinking and using drugs. She writes openly about her long struggles with addiction, sexual promiscuity, bulimia, and self-loathing. When she hit 30, things came to a crisis point, and in the throes of a hangover, just after having an abortion, Lamott says she felt the tangible presence of Jesus. A week later, she found herself at a Presbyterian church, pulled in by the music. Ms. LAMOTT (From Video at Church): But I love the singing, and I feel this food coming into my soul. You know, they just let me be there. And eventually I got sober. And right before I got sober, I had a conversion experience. I found that I was really drawn to the Jesus part. And I didn’t want to be. LAWTON: She says she surrendered her life to Jesus in a prayer laced with the F-word. Ms. LAMOTT: So I was a drunk new Christian, and I saw Jesus as sort of my friend and companion whose presence I could feel all the time, much to my own horror in the beginning. I didn’t want that to be the truth. I didn’t want to be a Christian. I was raised to think Christians are idiots. 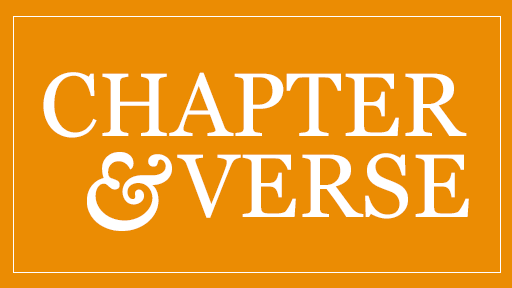 LAWTON: She became a member of the church – St. Andrew Presbyterian in Marin City –and she began getting her life together. Her 1999 best-selling book TRAVELING MERCIES chronicles her path to faith and her struggles living out that faith as a writer and as a single mother to her son, Sam. She continues those reflections in her latest book, PLAN B, where she writes about dealing with Sam’s entrance into adolescence and her own into menopause. Her earthy candor resonates with many readers. Ms. LAMOTT: Some days go better than others, and the bad days are awful. And it’s hard to think of yourself as anyone God could love no matter how low God’s standards are. So people tell me it’s a relief to know that someone they admire is like that a lot. LAWTON: She writes about themes of hope, grace, and forgiveness — those moments, she says, when the transcendent pierces through the cracks of everyday hardship, failure, and grief. Ms. LAMOTT: We’re talking about feeding and nurturing the human spirit and bringing that forth into a world that is so thirsty and so starving to death and so battered. LAWTON: How do you keep your own spirituality charged up? Ms. LAMOTT: I go to church every Sunday, which is like going to the gas station once a week and really, really filling up. LAWTON: She also spends quiet time every day in her meditation shed, a small structure behind her home that Sam and some friends built. Ms. LAMOTT: It’s really just my place of serenity, where there is no electricity. LAWTON: Lamott also writes and speaks widely about her liberal politics. Ms. LAMOTT (In California Speech): I want to really help overthrow and tear down this government, which I mean in a loving Christian way. LAWTON: PLAN B contains several diatribes against President George W. Bush. Ms. LAMOTT: My faith has been so challenged because I feel such a deep hatred and sense of betrayal as an American by the Bush administration. And yet Jesus said about four things that are absolutely the core of Christianity, and one of them is you really don’t get to hate anyone. LAWTON: Even some reviewers sympathetic to her views have suggested the political interferes with the spiritual messages of the book. Ms. LAMOTT: It’s not my business to separate them out so that my political readers will feel more comfortable and that my readers who are more spiritual or creative won’t feel uncomfortable because it’s so political. LAWTON: Lamott cannot be easily put in a box. She says her secular friends think she’s a crazy Jesus freak who believes in the Holy Spirit and the resurrection. She’s a Protestant who wears a Mary medallion around her neck and a red string blessed by the Dalai Lama around her wrist. Many evangelicals are deeply uncomfortable with what they consider her loose theological views and her outspoken, obscenity-laden, pro-choice, pro-gay positions. Ms. LAMOTT: Evangelical Christians and I can sit down and talk one on one about how much we love Jesus, and yet I’m not carried in Christian bookstores. You know, a typical Christian bookstore would not carry TRAVELING MERCIES or PLAN B, because I’m irreverent. I have a very dark sense of humor. I swear. I have a very playful relationship with Jesus. LAWTON: She says she’s particularly wounded by some criticism that her faith is simplistic and self-absorbed. Ms. LAMOTT: It pierced me to the core. And I thought for part of a day that I really had to either stop talking about it so much or come up with a more sophisticated, maybe more of an East Coast kind of happening, intellectual faith. And then, I don’t know, I took a nap or something, and that passed. And I thought, all I can do is really share what I think are the important stories of my life and our times. LAWTON: But she remains encouraged by the readers who say her depictions of faith have had a profound spiritual impact. In the end, she says all she can do is depend on God’s grace and love. Ms. LAMOTT: Sometimes I can imagine God just shaking his or her head going, “Oh Annie, whatever.” And other times, I just feel, even at my most — when I have been at my most awful, feeling cast out and lost and it’s all hopeless — I feel the love of a mother-father God. I feel loved like a baby would be. LAWTON: That, she says, is the most important thing she wants to convey to her readers. I’m Kim Lawton in Northern California. 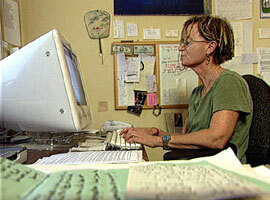 iVillage: "Anne Lamott: My Efforts to Walk a Spiritual Path as a Mother"